In honor of Canada's birthday the lovely bloggettes - Chrystal, Carmel and Aislynn are hosting this fabulous blog hop! Now, to celebrate Canada Day, I'm giving away an ARC of an highly anticipated book by a fabulous Canadian (TORONTO!) writer, Kenneth Oppel. 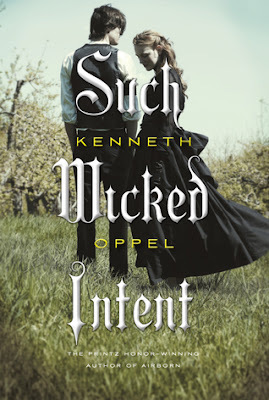 Yes, my lovelies, you can win an ARC of Such Wicked Intent! BACON! Marianas Trench! Hockey!! GO JETS GO!!! and...Maple syrup!!! A meaningful post about Canada?!?! Where do I begin! Personally, I LOVE my country. This is a beautiful place to live and I wouldn't leave it for anything. Currently, I'm outside on my patio enjoying the birds, frogs, and the sunshine. When I think of Canada I think of hockey and maple syrup! lol But no seriously, I think of my best friend that moved there last year! Raffi comes to mind. My kids love him. I love Canada (since I live here). First thing I think of is obviously hockey! trees, and a lots of green. Poutine for sure! Nice people, and amazing cities. I love being Canadian. Thanks for the chance to win this Evie! I am pretty excited to read it. When I think of Canada I think of my friend who's from Canada. She always gets so defensive when someone says something about Canada, and it's become a running joke in my group of friends. Every time we hear Canada we always have to single her out. It's pretty great. I always think about there amazing Rock Bands. Who said Go Jets Go? Hahaha! Um, hi Evie, really sorry about my TO trip falling apart. Hope to hang out with you at SOME point in our lives! Hrm, and oh yeah, been looking at getting this book eep! Thanks for the giveaway! Hockey, Maple Syrup, Beaver, Free Health Care, and Winter. Toronto Maple Leafs! Maple Syrup! I always think about the time Conan O'Brian did a week of shows in Canada. He did a segment were he was a Canadian Mountie at the US Canada border. It always makes me chuckle. Thank you for the international giveaway and Happy Canada Day! I think of one of my favourite tv shows Being Erica, of hockey and maple syrup :). Thanks for making this giveaway international. The first thing that comes into my mind is the beautiful Canadian lakes, cities and the maple syrup :DD I've never been to Canada, but it's my biggest dream to visit one day! I've only been to Niagra Falls in Canada, but I think of maple syrup, those mountie guys on horses and universal healthcare (which I think rocks). Lol! Yes, I'm random. When i think of Canada I think of home. I think of a country that started Hockey. Of on the truly appreciates its people and its land. Where people are welcome, and where people are more friendly. HOME!! Followed by a maple leaf. True North, strong and free. SUPERNATURAL! MAPLE LEAF! MONTREAL! HOW I MET YOUR MOTHER'S ROBIN! What comes to mind when I think of Canada? Home. Beauty. Scenery. Amazing indie music. Poutine. The CN Tower. Niagara Falls. The parliament buildings in Ottawa. When I think of Canada, I think of Niagra Falls and all my friends I've met through blogging and books, and all the (Canadian) authors that brought us there in the first place. Thanks for participating in the blog hop and for hosting this particular giveaway. I'd love the chance to win this. The first thing I think of is TV. Many of my favorite shows are filmed in Canada. Thanks so much for the chance to win! I think of the fabulous 4 months I spent travelling from one end of Canada to the other! I especially loved Montreal, Banff and Vancouver! Thanks for this amazing giveaway - I would love to win it! Immigration! Canada is such a diverse country, and we have so many different cultures to experience here!! I'm first generation Canadian, and I'm just thankful my parents ended up here! I think of Winter, moose & my nephew who lives there now. and then French...and a lot of Chinese people. I have quite a few friends there. When I think of Canada I think of hockey (go Habs!) and poutine. I love Canada from Whistler to Toronto to St Johns, its an awesome place to live. I think about snow, smoked salmon, and maple leaves. When I think of Canada I think of the vacations that my family took there when I was young. Especially the two trips I took to Toronto. I loved the Toronto Zoo. When I think of Canada it puts me in mind of these HUGE chocolate eggs I used to get at Easter when I lived in Montreal. the first thing about Canada comes in my mind is Maple leaf. I think of anything Maple!!! So great to meet other Canadian bloggers. Happy Canada Day! Thanks for the giveaway, I love so many things, but I love our food (maple syrup, bacon, poutine, ketchup chips...) best! Kenneth Oppel is such a great Canadian author! I think about Niagara Falls because I was there recently. Thanks so much Evie for taking part in this years Canada Day Blog Hop! Hope you and your family had an amazing weekend! I think of it as home. I think of all of its beauty. I'm not Canadian, but a New Yorker. I think of beauty, trees, hockey, maple syrup, and cold. Hmm I must admit Books, beaver tails and moose track ice cream (obviously food :P) and our forever awesome CANADIAN BLOGGERS :D lol! I think about all the beautiful scenery in BC. I've been to many places there and Alberta as well. Canada is awesome! I'd have to be honest and say hockey and maple leaves. Although I am a huge maple syrup fanatic, so I feel much love for Canada for being associated with it. And it seems like a beautiful place to visit, on my bucket list for sure! Ice Wine! I have a close friend in the Stettler area, and whenever he comes to visit, he brings me a couple of bottles! First thing that comes to mind is the Maple leaf on the flag and then snow and scenery!! Hi, thank u for this awesome giveaway and making it international. First thing in mind when I was thinking about Canada is Celine Dion *big grin* She was born in Quebec, isn't she? She's my favorite singer ever. when I think Canada, I think of two things, the awesome bloggers that I follow from there...and there are quite a few and a middles school trip I took a LONG time ago, it was fun. This is an awesome giveaway! Thanks! When i think of Canada i think of maple leaves and Canadian bacon. Also that i don't think i've ever been there because i don't have a passport and would be sad if i was trapped there. Do people in Canada just call it Bacon? Ice Hockey, Robin from How I Met Your Mother, confusion with Americans. Yes, I believe I need a trip to Canada to sort getting a better list! I wonder if everyone can see Russia from their houses in Canada. As to Canada, I love travelling and I do it a couple of times of year, but when I'm away it's like I'm waiting to exhale til I come home. No matter where I am and how cool the place is somewhere inside me is always waiting to come home to Canada. It's the dumbest thing but when I see that Tim Hortons ad on the luggage pick up that says Welcome Home only then do I feel ok and breathe again. My favorite friends were Canadian while I was living in Korea. Nicest people alive! Wow. Okay well when I think of my country, I think we are the luckiest people on the planet. I feel so safe here and I'm so proud to call it home. As much as I may want to move to another country when I'm older, another part of me is shaking my head and saying "Why would you want to leave?" As Karana said above, as weird as this sounds, the Tim Hortons in the airports are something that will always make me feel like I'm home! I think of maple syrup and hockey. I think of maple syrup and bacon...and bears. Have a little teddy bear from Canada.